Four men and two women will spend eight months in a dome on a Hawaiian volcano, as part of a human behavior study designed to help NASA prepare astronauts for the journey to Mars. January 21, 2017 —The eight-month journey to Mars is expected to be arduous, with its cramped conditions, isolation, and monotony. By simulating Mars-like conditions on Earth, NASA hopes to learn how to mitigate the challenges. On Thursday, the latest simulation began. 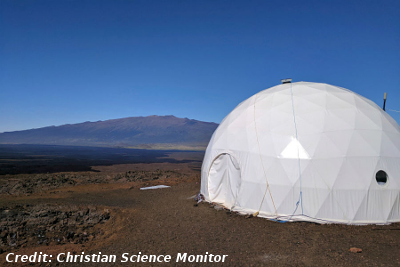 Four men and two women – carefully selected from over 700 applicants – moved into a vinyl-coated pod just below the summit of Mauna Loa, the world’s largest active volcano. During their eight-month stay, which mimics the journey to and life on Mars, they will eat primarily freeze-dried foods, have limited personal space, and experience a 20-minute lag in communications (the length of time it takes a message to travel from Mars to Earth).